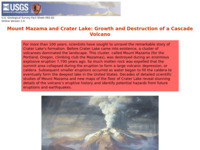 This fact sheet from the U.S. Geological Survey summarizes the geologic story of Mount Mazama and Crater Lake caldera. Possible future geologic activity and recent studies of the caldera floor beneath the lake are also discussed. Links are provided to other sources of information about Crater Lake, other Cascades volcanoes, and volcanic hazards.